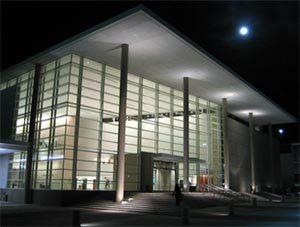 Situated in the Galatyn Park Urban Center in Richardsons Telecom Corridor® area, the Charles W. Eisemann Center for Performing Arts and Corporate Presentations is a magnet, attracting people from throughout North Texas who attend concerts, theatrical performances, and business meetings in a 117,000 square foot, multi-purpose public facility. Upon entry at the City of Richardson/Renaissance Hotel Parking garage you will arrive at a set of blue elevator doors which are marked at the top Eisemann Center. Please enter the elevator on the left of the two blue elevators and push the button inside designated Eisemann Center. This will place you on the main floor, after the elevator arrives on the main floor the opposite door will open allowing you entrance directly into our lobby area. The Moody Performance Hall is a multi-disciplinary center that will bring to the Dallas Arts District a broad range of cultural performances and events by a growing group of small and midsize cultural organizations that represent all artistic disciplines and the diverse heritages of our community. Located at the intersection of Routh and Flora, the Moody Performance Hall will be a gateway to the Arts District.